Letting your kid watch television? Is it good or bad for the kid? Can the kid watch television – A big debate is going on! Well, we are living in a fast paced world, where many moms could not find adequate time to spend with the kid! Busy moms find television as a great resort to make their naughty kids rest in a single place! Although it is not a healthy practice, watching television has some benefits for the kids. What are the benefits of kids watching television? Television is undoubtedly a great source of entertainment and relaxation, even for the kids. Eat, play, sleep, cry, etc. are the routine of the kids. Watching television gives a new sort of entertainment to the kids. For instance, watching the kids’ education program, cartoons, etc. If you could not find any other resort to calm down your kid, make the little one watching the favorite program calms the naughty kid. Television brings everything home! Many parents consider that through various programs, it is possible to educate and expose the children to various aspects. Splash of colors, various cultures, people, animals, birds, places, etc. can be seen in the TV screen. When it comes of drawbacks in watching television, one reason interrelates and impact with others! How televisions affect your kid? The major disadvantage of kids’ watching television is – delayed speech. Kids watching television could not pick up language soon! While language development and speech is influenced by many reasons from genetic factors to lack of attention and conversation with the kids, watching television is one of the major reasons. Besides, there is a hidden reason behind the delayed speech with watching television. If you and your kid watch television, you obviously have lesser or reduced communication or interaction with the kid. You may argue that the TV actually ‘talks’ to your kid, yet, the kids are attracted by the images, videos, movements and colors rather than what is spoken! Watching television several hours a day makes your kid addicted towards it! Even elderly people get addicted towards TV programs. If you are addicted to something, then you don’t obviously concentrate on other important things. For instance, if you are addicted to a certain TV show, you will skip all other crucial aspects, even food! Your kids are not exceptional. It becomes very difficult to make your kid concentrate on other things. Watching TV, although is a sort of entertainment for kids; it doesn’t involve any physical activity. 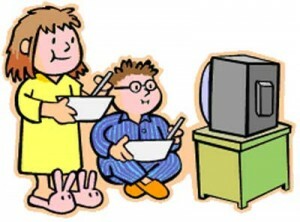 The kids may sit or lie down and watch TV for several hours a day, which impact the growth, rather make the kids lazy! If this habit continues, your kid will become a potato couch in a few years. Needless to say that lack of activities makes them obese! You can really raise a smart and intelligent kid if you let your kid watch TV all the times. Kids creative mind and thinking will be at its peak up to 5 years of age. Watching television eats up their interactive time, which impacts the brain development! Although there is no direct relationship with watching TV and child’s mental growth, instead of television, you can engage your child in creative activities, which will help them bring out their hidden smartness, spice-up their knowledge, make them more creative. So, what is the solution? Consider the disadvantages of letting your kids watch television. Watching TV for one or two hours (not in a single stretch) does no harm to your kid. Make sure that your kid gets adequate exposure to other factors mentioned above. Good and bad of watching TV for kidsKids’ watch television – Pros and ConsWatching TV is good or bad for kids? We know that television viewing can be addictive to kids of all ages. In addition, exposure to the wrong programming can have a negative effect on their behavior. That is why it is important to control how many hours kids spend watching the tv. Personally, I just don’t keep a television in the house. It may sound harsh, but it prevents a lot of headaches. People could be addicted to TV and become inactive and lazy so I think it is better of not watching TV would make you healthier and BECOME ACTIVE! It is still me, But this time, it’s good things, first, you could settle down your kids by making them watch calm, soft movies, you could also make them happy to help by doing what makes them happy, for example: Watching TV makes me happy! I really appreciate how you mentioned that children can get exposure to other cultures, activities, and colors by watching television! My husband and I are trying to figure out the best way to keep our kids engaged and continue the education they’re getting at school when they’re relaxing at home. We’ll have to find a satellite network that can allow us to get the signal we need for our television so our kids can learn about the world around them in a way that’s comfortable for them. Thanks for the tips.